Well, We did it. We were there at the Business Expo among all the major players (VW, Dunkin' Donuts, Little Debbie, et al. ), and we came out with 2nd prize for our booth! They announced it during the awards luncheon, and we returned to our booth to an empty sample tray. So, it seems word spread quickly! 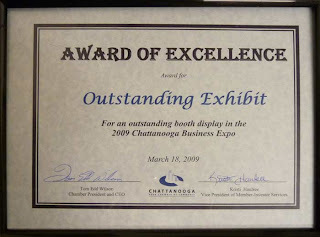 We did have a couple trade show warm-ups (The Formal Affair and Chattanooga Made) before this one, but it still came as a surprise as most businesses had a lot more elaborate set-ups than we did... 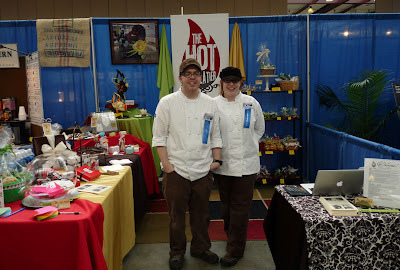 I hope they judged our booth by the amount of products we had displayed as well as the two chocolate sculptures seen in the background. These shows are fun, but can wear a person out!